P.U.C. are 'Public Utilities Commission' plates, issued to trucks from sometime in the early 1940s until 1971. During the war, these plates were made of a fiberboard - the only Connecticut plates to be made of that material. These plates were displayed on the front of the truck along with the normal registration plate(s) from the state(s) in which the truck was registered. These plates commonly appeared on trucks registered in states other than Connecticut. Colors were black and yellow, which reversed every year. This series ended in 1971. Click the photo to see this type in use. This plate is made of a fiberboard, with the numbers embossed into it. These were used during the war in lieu of metal plates. 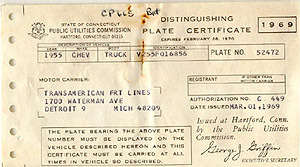 1969 Registration certificate for the plate to the left. This series ended in 1971. It would have been interesting to see what the numbering format became had these plates continued for another year or two.